With more and more travel essential gadgets requiring charging, it’s little wonder that people are turning to portable battery packs to help fill the power gap when travelling. Be aware that not all battery packs are created equal in build, quality or price. Below I’ve listed 5 of the most common and widely regarded best chargers on the market at multiple price points. We carry several portable battery packs when we travel, including traditional and solar powered types. We use them for charging phones, Kindles, Nintendo DS, even laptops on the road. 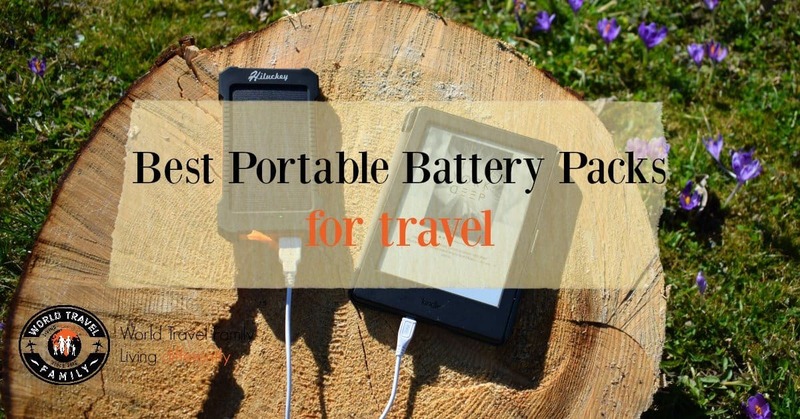 If your travel plans involve long journeys or locations and countries where power availability will be an issue, you should most certainly be investing in portable battery packs. 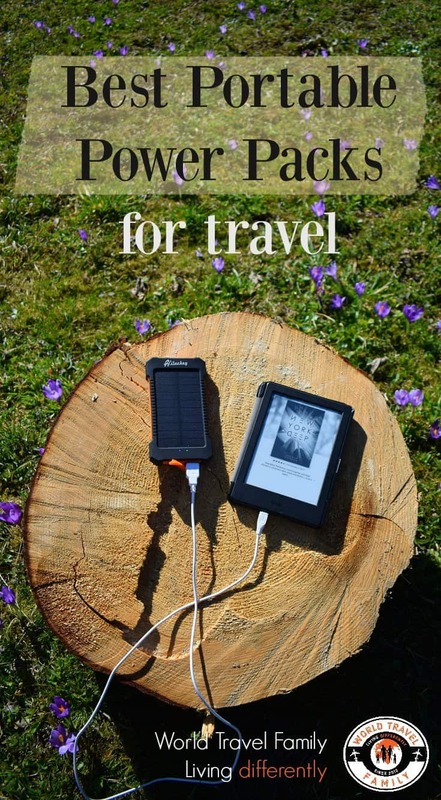 We would suggest carrying these portable charging devices at all time in countries liable to regular power outages ( India, Nepal), for all Africa overlanding and for any travel where you will spend days on buses and trains. You’ll even find them useful on some airlines still, by no means all planes have charging facilities. 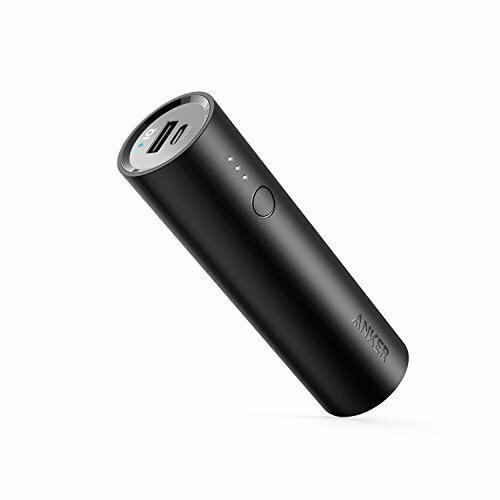 This little power pack is great for day trips where you just need a top up. Small enough to fit in your pocket but powerful enough to charge a couple of phones or the same a few times if you’re really power hungry, this one doesn’t hurt your wallet. Compact. One of the smallest and lightest 10000mAh portable charger (2.36 x 3.62 x 0.87 in, 6.4oz). Provides almost three-and-a-half iPhone 6s charges or three Galaxy S6 charges. Fast. Anker’s PowerIQ and VoltageBoost give you the fastest possible charge. Qualcomm Quick Charge not supported. Safe. Anker’s MultiProtect safety system ensures complete protection for you and your devices. The smallest and cheapest charger, less charge than the model above but a lower price. Really only suitable for a day trip. This charger will get you out of a low battery warning but isn’t going to get you much further. Capacity. Contains 5000 mAh of power. Enough to provide two charges to an iPhone 6s or at least one to a Galaxy S7. Fast. Equipped with exclusive PowerIQ technology, it provides the fastest charge to any phone or tablet (up to 2A). What You Get. PowerCore 5000, travel pouch, Micro-USB cable, welcome guide and an 18-month warranty. For the serious power user. With a massive 26800mAh capacity this will last for those weekends away. 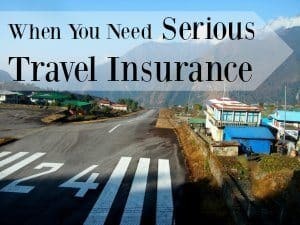 If you’re traveling off the grid for a short time this is the one to have. Big enough to do tablets as well as phones this will cover all bases. It can even charge more than one device at a time. It also recharges itself twice as quickly as other devices meaning you should never be stuck without power. More expensive as far as battery packs go but this ticks all the boxes if you really need a large amount of portable power. If you don’t want the solar, I’d choose this one for travel. High-Speed Charging: 3 USB outlet ports with Anker’s PowerIQ and VoltageBoost technology forhigh-speed charging for three devices simultaneously (max output 6A, single-port max output 3A). Faster Recharge. Dual Micro USB (20W) input for recharge speeds up to twice as fast as standard portable chargers—a full recharge takes just over 6 hours. What You Get: PowerCore 26800, 2X Micro USB Cable, Travel Pouch, Welcome Guide and an 18-month warranty. This is the deluxe of power chargers. Can charge 3 devices simultaneously up to 6A and will recharge twice as quickly as other chargers. Comes with a handy wall socket. When fully charged you could get a weeks worth of charges out of it. 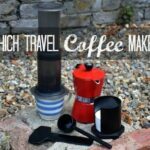 Perfect for an off the grid holiday or trekking. Think Himalayas here people. The price matches the performance. Not the cheapest but by far the best in terms of what it can achieve. Suits families with more than one device to charge. Qualcomm Quick Charge 3.0: Using Qualcomm’s advanced Quick Charge 3.0 technology, PowerCore+ allows compatible devices to charge 85% faster. Recharges itself twice as fast with the included wall charger. Fast-Charging. Exclusive to Anker, PowerIQ and VoltageBoost technologies combine to provide universal full speed charging for non-Quick Charge devices, up to 3 amps per port. Extra Capacity: PowerCore+ 26800 is one of the world’s highest capacity portable charger with Quick Charge 3.0 technology. It charges the iPhone 6s 9 times, the Galaxy S6 over seven times or the 2015 MacBook more than three times. 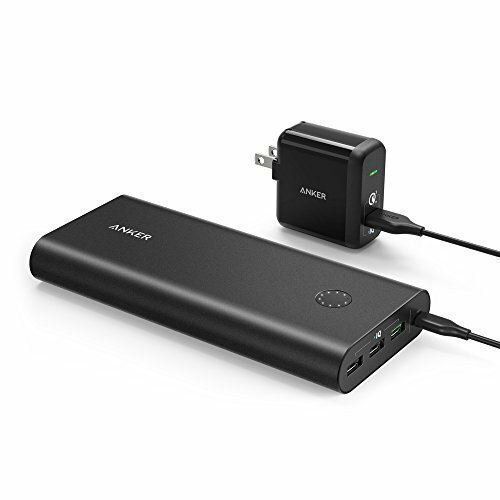 What You Get: Anker PowerCore+ 26800, PowerPort+ 1 with Quick Charge 3.0, Micro USB cable, travel pouch, welcome guide and 18-month worry-free warranty. This is the solar powered charger I have and use. I like that it can be either solar or power charged. Being rugged, water resistant, dust resistant, and shock proof means I’m not worried about it getting damaged as we travel the world. The solar charge part is great for topping up any charge, anywhere. Just leaving it on a table in sunlight means it is topping up. With the added bonus of a built-in torch for night time in new hotels, it is ideal on many levels. The price is also great. 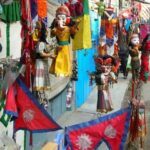 This is the one we use for trekking in Nepal when power is hard to come by. It has a lower charge capacity, the same as the model at the top of the page, but the ability to top up in daylight makes that fact unimportant. 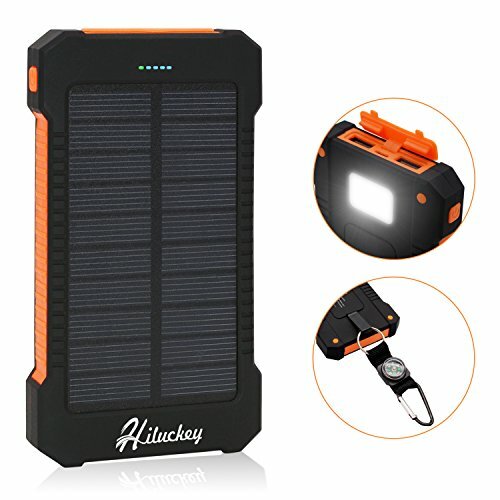 A built in 10000mAh lithium battery equipped with a compact solar panel, could recharge the battery itself under sunlight for emergency purpose while outdoor. Can also charge with it’s built in USB Port(input 5V1A) from mains supply. Rugged, rain resistant, dust-proof, shockproof & compact with good looks for any adventure traveller. Integrated LED indicators to show power status and charging progress. Portable and Lightweight. Easy to hold or put anywhere your want. Equipped with over-charge protection system. Can recharge by solar or outlet. Compatible with Smart phones and other 5V USB devices, Can charge iPhone more than 3 times. We’ve tested it, it does not require bright sunlight and will charge just fine indoors. We would suggest buying 2, one to use one to charge. Hook one on the outside of your pack. We’ve travelled for over 4 years with power packs and we use them all the time. We would suggest carrying at least 2 for a family. Our solar charged model, bought last year, is our favourite so far and we highly recommend carrying a couple of these for emergencies, maybe in conjunction with a maximum capacity model for laptop users. That’s a very good question. I don’t know sorry, but I’ll do some research. We’ve never needed one to be waterproof. I have a solar portable battery. I was in Puerto Rico for hurricane Maria and that’s what I used to power my phone and other essentials. They are very useful for power outages too. I didn’t know the importance of good battery packs until I went through my first hurricane. Do you mean the plug? They work anywhere so long as you can plug them in, we take ours all over the world. Thank you. We have an adapter for our plugs to for but no converter to switch 110v to 130v. Didn’t want to burn out my Ankers! If they’re selling them on UK Amazon they must be UK compatible. Check the spec on there. Wear as much as you can rather than packing it. This doesn’t sound cool but it is one of the best trick. Wear extra clothes inside your over coat and later remove them once you are on your sear after boarding the flight. A little extra layer of clothes on your body will give you a lot of free space in your bag. Now you have some extra space in your suitcase to put some more items. Thank you for the informative post. 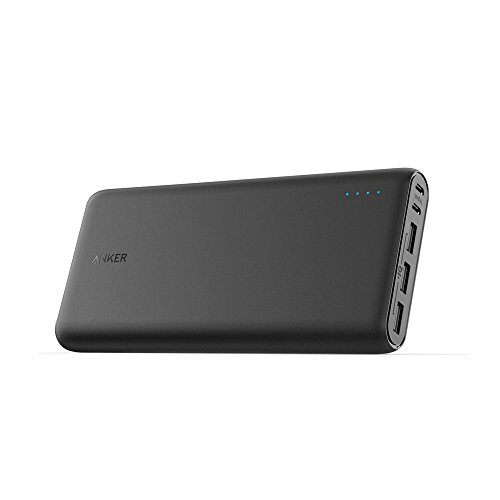 It is a great list of portable battery packs. 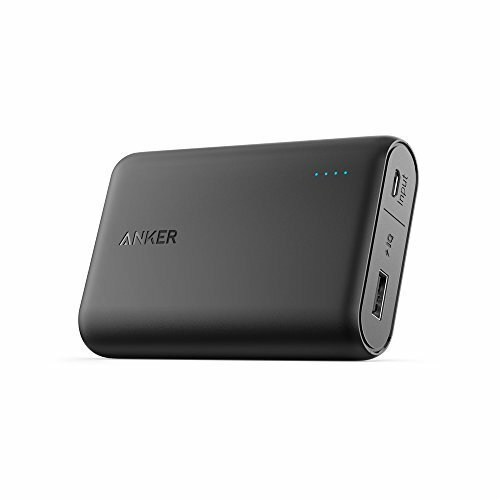 I currently use Anker PowerCore 10000, and I love it. All Anker’ products are good. 🙂 I also use a magnetic phone charge for more convenient and safe use, I think it’s good for your travel too! P/S: Your posts are awesome! I just followed you on Twitter. Hope to see your new post soon. Hello Alyson, I like this post. 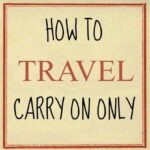 Portable battery for travel is the best option for all. This is the most travel essential gadgets requiring charging, This is an appreciable post. Thanks and keep sharing. I have read your impressive article. Perfect information with Detail Pics. Planning to buy some of the things that you’ve mentioned. Charges are a big part of our life and I would like to say thank you for sharing this. Keep it up! Great post! 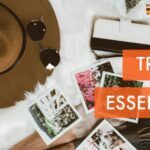 Chargers are my travel nemesis – I either forget then or they don’t work effectively, so will be checking out the ones on your list for sure. I especially love the idea of a solar option! I was indecisive about the Ankers but you seem to have sold me on the Hiluckey! Thanks for the info! We’ve just bought our first portable battery – still waiting for a chance to use it. Haha. I guess South America’s been quite reliable on the power thing. Oh how I love our portable battery packs. I also have a phone case that is an additional battery. When we are moving/travelling full time, that is the case I have on my phone 24/7. We also have one like the cylindrical one on your post, and another that is a flat pack, but it can double as a stand to hold your phone/ipad. I REALLY REALLY want solar powered ones though, and just use them all the time instead of having plugs in the wall all the time!!! We are in LOVE with our solar ones Sarah. So much easier and greener than plugging in. They seem to charge really quickly too, even indoors. Great post. I have been thinking of buying one of these for awhile now. Sorting out our next adventure once our little one is a bit older. Gives us awhile to plan. Will definitely get one of these now.